Those days are gone when events were managed and executed by humans. But now a these days technology has replaced more than 60% of human manpower to 60% of machine & technology power. These days we cannot imagine an event to be organised without technology. Technology enhances the beauty of the agenda or the performances performed or kept in-front of the audience. More the technology more is the attraction. These technologies includes sound, lighting, advertisement, the complex crowd management system and internal co-ordination between the organising and managing team. Whether it is a Cricket match, a Music Concert or a Corporate Seminar or meeting you can find the technology more than the actual point of attraction but these technologies are usually unnoticed because they are their to enhance the point of attraction. As we are in 21 century we have developed lot of technologies which also give impact on event industry. before a decade event industry not much more developed as these day we use laser technology,high class speaker system very high-tech lighting systems,wireless communication,and video conferencing system,lot of software for event management and security devices, accreditation printing systems, inventory management security device with drone cameras and CCTV. These days companies providing these thin on rent as well. Its a very huge industry even.now all over world is using event technology everything available online and a single click away. You can book tickets online,you can hire artists and sale tickets. Artists are performing globally. Event management industry booming in India. Now we have lot of event which are very known name in world like sunburn, NH7, Supersonic, IPL, ISL, PRO KABADDI etc. We are one of the top event security service provider for event and entertainment industry for every type of event like sports, concerts, exhibition and big level conferences etc. At Hire4event We feel pleasure to introduce ourselves as one of the growing organisations to serve in Security field. We have a bunch of professionals rolling things in the right direction. Our team is widely trusted and created a niche in our sphere of business. We are efficient in offering the best Security and IT Services. We are committed to supply high quality products, tailor made to suit the diverse needs of the Customers. Hire4event is a market Savoy organisation and understand the pulse of the market. We believe in unique work culture devoted to customer’s delight. Our products are not only easy to install but practically maintenance free and allows smooth and trouble free operations. Assuring you the best possible Services. We are biggest player in field of barricading and crowd management equipment in Delhi NCR. We introduce ourselves as an established leader in the field of Event management, Technical support, and fabrication for the exhibition, BTL, Radio Communications, Security devices, in the country and offer state of art, user-friendly products and solutions to meet the client requirements of mission-critical customers. The Company has rich experience in the field of Wireless Communication & latest technology in the International arena and is poised to establish itself in the Indian Market. Our core competency and expertise lies in the thorough understanding of the customer's requirement and offering solutions, rather than selling ‘black boxes'. We have structured thoughtful partnerships with global players in RF field, in our endeavour to offer "One stop solution in event production, MICE, CONFERENCES, SPORTS, ranging from Two way radios in VHF, UHF and HF frequency bands, Analogue Trunking and Digital Trunking in TETRA protocol TO Microwave digital radio links in 2.4 GHz, 5.7 GHz and 13 GHz. In Two-way radio segment, we officially represent MOTOROLA, VERTEX STANDARD, and BETA for their complete range of Ana-log, Digital Radios, Microwave Radios and Networking Products. The primary mandate of our organisation is to provide our customers with high-quality support services by being close to them and thereby understanding their precise requirement and equip them with the solution in a customised manner. Hire4event is catering to all market segments. Digital Trunking Portable and Mobile/Static Radios. Repair, AMC, and Installation of Wireless sets. 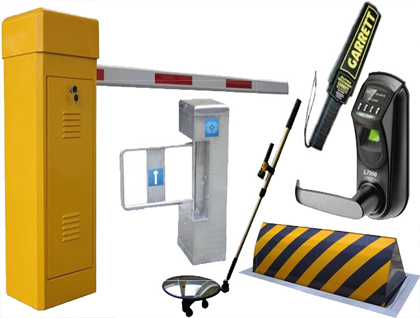 All types of Security Equipment like Metal Detectors, Searchlight, GPS, HHMD, DSMD & DFMD. Smart-net / Smart Trunk / Trunking Systems. Hire4event.com Has a team of highly experienced and technically competent manpower capable of implementing and maintaining complete wireless networks. We have installed large wireless networks for various clients in corporate, Govt. and semi-Govt. organisations. Some of the projects implemented and services offered by us are: - Private sectors like Security group, Multiplex Cinemas, Mall, Construction Companies, Educational Institutional, Hospitals, Aviation Sectors, and many other corporate clients. With all the above experience and a vast installation base, Hire4event.com today has emerged as a leading wireless solution provider. We would be keen to work with you and provide you with the most competitive solution for your requirement.